Mark Silver is a fourth-generation entrepreneur, a designated Master Teacher (“muqaddam murrabi“) within the Shaddhilliyya Sufi lineage, and the founder of Heart of Business - a company that offers a comprehensive entrepreneurial wisdom academy curriculum. Mark has facilitated thousands of individual sessions with entrepreneurs and has led hundreds of classes, seminars, groups and retreats. He and the Heart of Business team have helped many dozens (or it maybe hundreds now) of Awareness Community members take their conscious businesses to the next level. And here's a link to the Heart of Your Business training program (on a Pay From The Heart basis) mentioned in the episode. Jason Stein is a Mindful Business Coach who was a master acupuncturist and now helps wellness providers create solid profits, collaborate more effectively, and have a bigger impact. Together is Better is one of his favorite sayings and is a big part of how he's grown his business and teaches his clients to grow theirs. In this episode, RJ Hodges shares his tips and strategies that he uses with clients to help them transition from employee to entrepreneur. RJ Hodges is a professional speaker, certified personal mastery life coach, certified practitioner in the healing art of Reiki, and the creator of a coaching system known as L.I.F.E (Living in Full Existence) Education. He is a bestselling co-author of the book Mission Unstoppable partnering with world-renowned leaders George Fraser and Les Brown and also the author of You Can’t Practice At The Game, The Art of Mastering You Volume One. If you'd like support on your journey, the Awarepreneurs Community is a community of 300+ plus conscious social entrepreneurs. Come join us! In this episode, our dialogue guest is Due Quach. A refugee from Vietnam and a graduate of Harvard College and the Wharton MBA program, Due overcame the long-term effects of poverty and trauma by turning to neuroscience and meditation. After building a successful international business career in management consulting and private equity investments, Due traveled throughout Asia to study various contemplative traditions and then created the Calm Clarity Program to make mindful leadership accessible to people of all backgrounds. 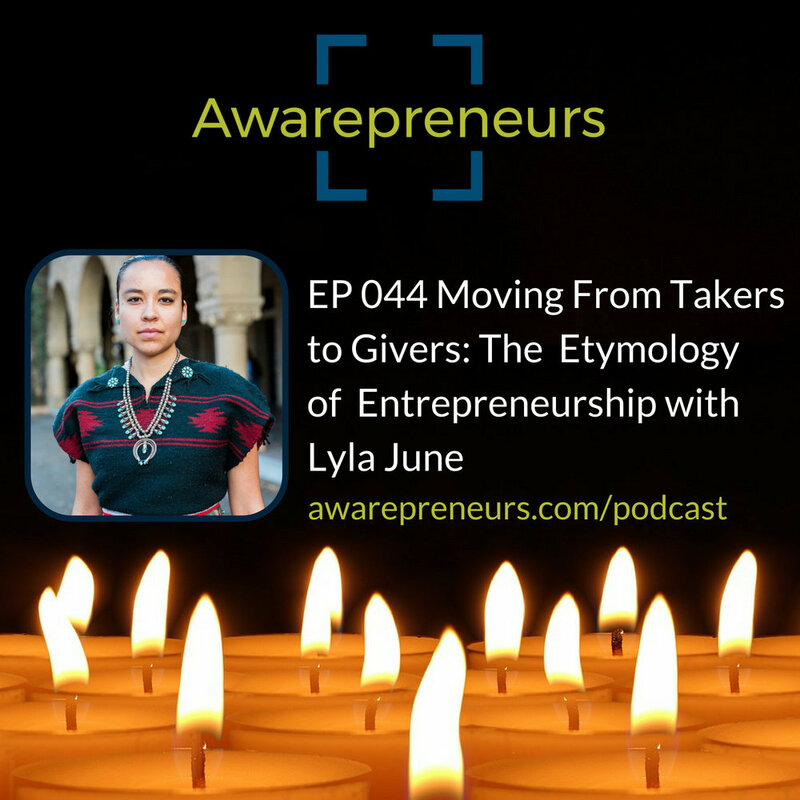 We explore these kinds of topics on a daily basis - including a discussion of this episode - in the Awarepreneurs Community. We'd love to have your input as part of the conversation! In this episode, our dialogue guest is Lyla June. Lyla is a renowned public speaker, poet, hip-hop artist and acoustic singer-songwriter of Diné (Navajo) and Tsétsêhéstâhese (Cheyenne) lineages. Her music and message centers around intergenerational and inter-ethnic healing, as well as an articulation of Indigenous Philosophy. Lyla's resonant message and ability to convey paths forward for indigenous liberation have brought her to universities, school assemblies, conferences, music festivals, and community centers across the United States and over ten nations around the world. In our dialogue, we look honestly at the exploitative roots of entrepreneurship and, instead, how to create a business that is truly healing. In this episode, our dialogue guest is Felina Danalis. After a fast paced and stressful 20 year career in the broader space of sustainability and international development, witnessed a traumatic car bombing and felt called to make major changes in her life. Today she's a coach who works with individuals, organizations and companies to use the principles of mindfulness and emotional intelligence, in work and in life. A significant part of her business is customized individual retreats in her home city of Palm Springs, CA. Join Felina as she shares in detail about this innovative approach to growing a spiritual business. 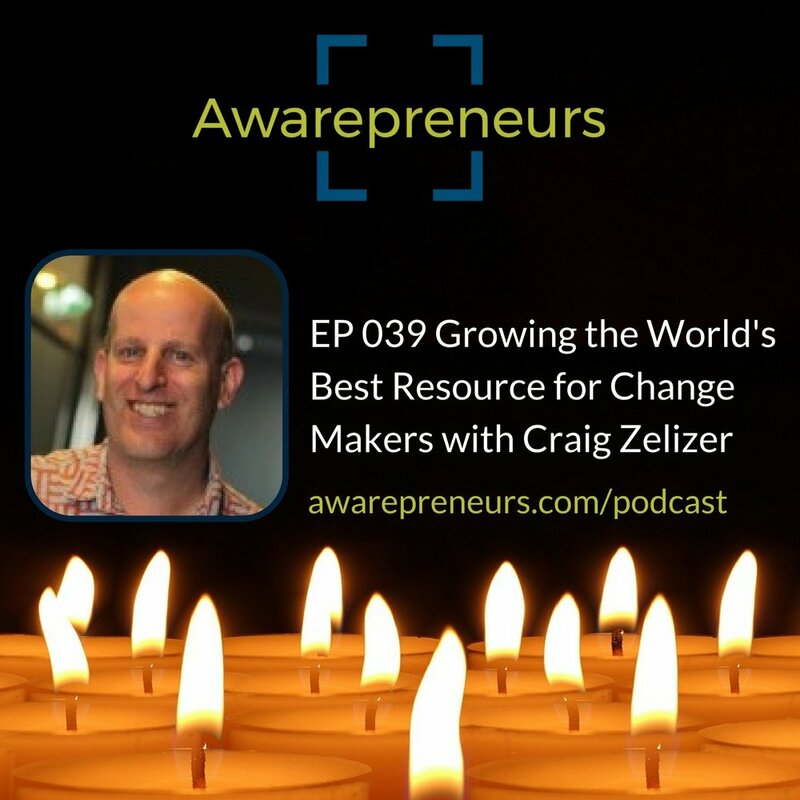 We explore these kinds of topics on a daily basis - including a discussion of this episode - in the Awarepreneurs membership community. We'd love to have your input as part of the conversation! In this episode, our dialogue guest is Briana Cavanaugh. Briana is a Financial Bliss Mentor Coach and Accountant. She has been doing accounting since 2003 and have more than 20 years of experience in various forms of coaching and counseling. Briana believes that Change Makers and Business Owners have the capacity to be successful and that money is a key part of that transition from chaos and overwhelm to bliss. She works at the intersection of money, pleasure, self love and accounting. In this episode, our dialogue guest is Reva Patwardhan. Reva is the founder of Dialogue Lab, which helps social impact leaders collaborate to build resilient organizations and unstoppable movements. She does that by helping leaders learn to embrace the tough, liberating conversations that power social change from the ground up. And she helps them build stronger collaborative relationships based on mutual and collective learning. In this episode, our dialogue guest is Bryant Galindo. Bryant completed a Negotiation and Conflict Resolution Master's program at Columbia University, did pro bono work as a Mediator for a U.S. federal agency, and quickly realized that the job he wanted (one that offered the ability to empower others in resolving their issues) wasn't out there. So he set out to create it, knowing that his skills in negotiation and conflict resolution were badly needed. After helping his friends negotiate salaries and contracts in the tech, nonprofit, and government sectors, Workplace Collaborations was born to help other Millennials who also have difficulties vocalizing their needs without sounding entitled. In this episode, our dialogue guest is Ric Mathis. His first visual production was entitled “Word”, which featured The Last Poets, Cee-Lo Green, Sonya Sanchez, Amiri Baraka, and more. Recently, he has garnered attention as executive director of the provocative documentary Black Friday. The documentary explores why African Americans have consistently remained in the lowest percentile of America’s wealth gap, while also presenting insight on how to restore the circulation of wealth in Black communities. In addition, he has received praise from global brands such as Wal-Mart, Bigen, Pepsi, Essence Music Festival, 100 Black Men, Big Brothers & Sisters, and Home Dept. In this episode, our dialogue guest is George Kao. Since 2009, George's full-time business has been coaching and mentoring clients, to help them create sustainable & joyful businesses. His specialty is helping people grow their audience, through authentic online marketing. 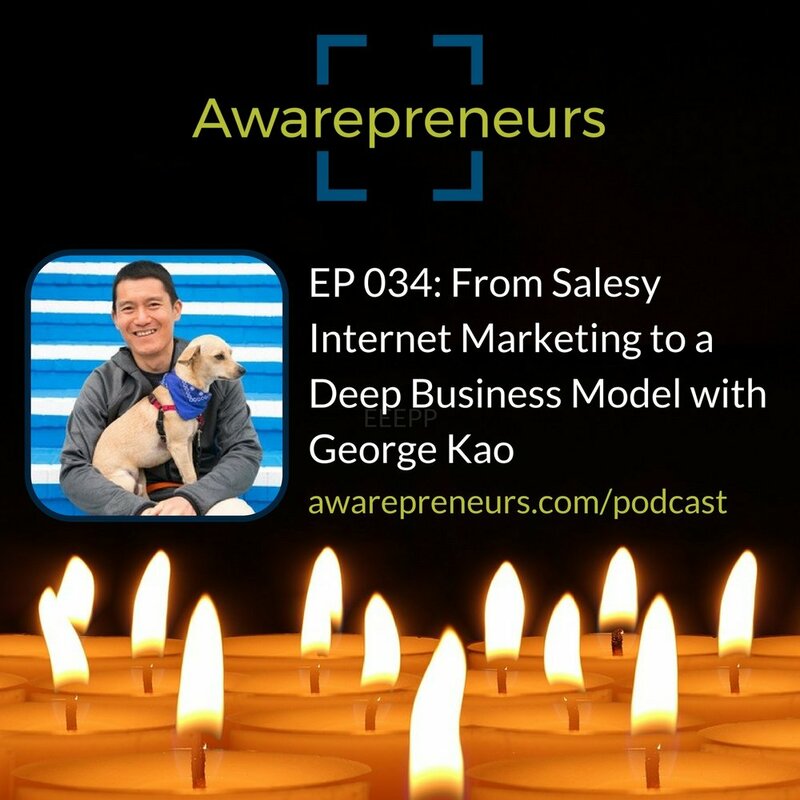 George has deepened his business model considerably over the years and shares what he has learned with great transparency. In this episode, I interview Shana James. Over the past 15 years, Shana has coached a diverse group of nearly a thousand men — leaders, CEOs, authors, speakers and men with big visions. In this work, she has come to see the unique circumstances leaders face in romantic and sexual relationships and has developed a reputation for being on the forefront of helping leaders cultivate a life that includes love, leadership AND a positive legacy. We explore these topics on a daily basis - including a discussion of this episode - in the inclusive Awarepreneurs membership community. We'd love to have your input and questions as part of the dailogue! In this episode, I interview Joshua Hathaway, one of the cofounders of The Brotherhood Community. He has over 12 years experience in teaching NonViolent Communication, private coaching and counseling with hundreds of individuals and his No Bullsh!t brandcommunication trainings have been delivered extensively to private and corporate clients such as Zappos and LYFT. One of Joshua's biggest passions at this time is to be a dynamic part of the movement to reinvent masculinity in healthy ways. As always, we explore these topics on a daily basis - including a discussion of this episode - in the inclusive Awarepreneurs membership community. We'd love to have your voice in the dailogue!